I winged this dish on Friday night and enjoyed it enough that I wanted to record the essence. The ratios are not battle-tested, but one of the prime purposes of this blog is to help me remember stuff like this. In a large saute pan, melt the butter and olive oil on medium low heat and then add the onion. Cook slowly, stirring occasionally, until the onions are soft and translucent. Add in the mushrooms, thyme, a pinch or two of hot chili pepper flakes, and some salt and pepper and saute until the mushrooms are soft. Add the flour and cook, stirring, for 2 minutes. Add the vermouth (or wine) and after a few minutes add the milk. I don’t know exactly how much milk I put in but I would guess about 2 cups. Bring the milk to a very gentle simmer, stirring fairly frequently, and control the heat so that it does not start to simmer more aggressively. Stir in the mustard and add salt and pepper to taste. Cook for another 10 minutes or so, giving the sauce time to thicken and come together. Don’t forget to start the rice. Add the chicken, cover, and poach until they are cooked through (probably 5 to 10 minutes, depending on thickness of pieces). Serve the chicken on top of the rice, heaping on the sauce. Yes, I’m a sucker for breadcrumbs. I cooked the dish that very night to bid adieu to L’s mother, flying back to Sydney the next day. 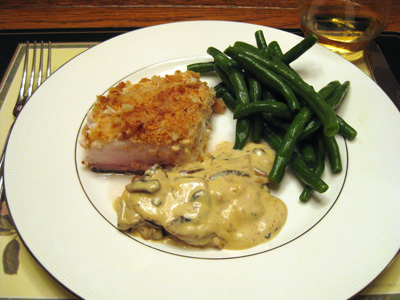 I made a few small adaptations, and the results were absolutely delicious and comforting. This dish will be back on the menu again in future, no question. 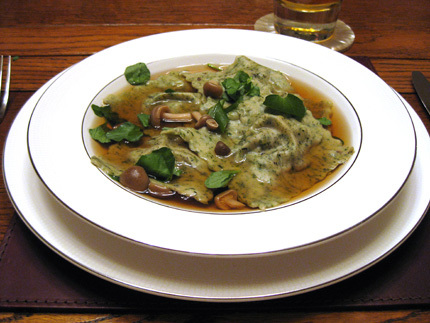 Homemade ravioli, stuffed with shiitake mushrooms, chard stems, shallots, pine nuts, parsley and parmesan, made from fresh beet-leaf pasta, served with a dashi-mushroom broth with watercress, scallion greens, and shimeji mushrooms. That’s a mouthful to say, but was an absolute delight to eat. It was also my first attempt to make up an Asian-European fusion dish, and emerged out of my need to give the old creative cooking juices a swift kick in the pants. For the last few months, I poured my energy into a startup project, but unfortunately it became clear that the necessary funding resources were not going to emerge. Creative cooking took a back seat, but last night’s meal was its way of pounding a fist on the table and crying “my turn, dammit!” I was quite proud of the results, if I can say so myself. I’ve been a fan of fusion since it burst on the New York City restaurant scene in the mid-nineties (flashback to an incredible dinner with Aun, my then-roommate and now the author of the marvelous blog Chubby Hubby, with a Japanese-Italian pasta-and-squid-ink dish served in a bowl made from a huge cheese rind. I love me some cheese!). Every once in a while, you read amusing stories about the tension and strife that ensue when cooking in your mother’s kitchen. The hovering. The unsought advice. The skeptical brow. Unfortunately for you, dear reader, I have no such stories from this recent dinner. In the making of this ramp and mushroom risotto, I had free reign. Perhaps it is because I am male, or perhaps it is simply the nature of my mom, but there was no drama to rivet this tale. I think we got most of the mother-child conflict out of our systems when I was in high school and needed heavy pushing to study and get into a good college. Her obstinate determination at that task exceeded even my own innate and not-insubstantial stubbornness. In the end, her mission was accomplished, for which I am eternally grateful. Turning the tables and making her a great meal is the least I can do. 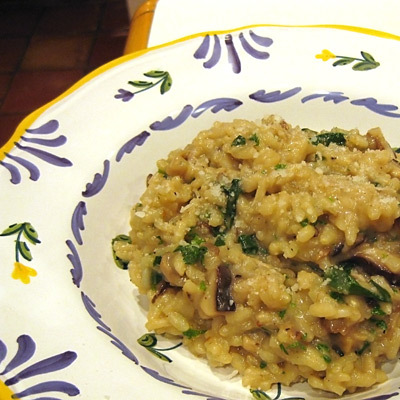 This risotto, while not innovative in the slightest, was particularly good for three reasons: a homemade vegetable broth made with patience, the use of the last of my ramps, and a mix of porcini, shiitake and oyster mushrooms. I used to make savory crepes all the time, and do not know why I ever fell out of the habit. The basic premise is that you create a stack of crepes and complementary fillings, and then bake for a brief period in the oven. 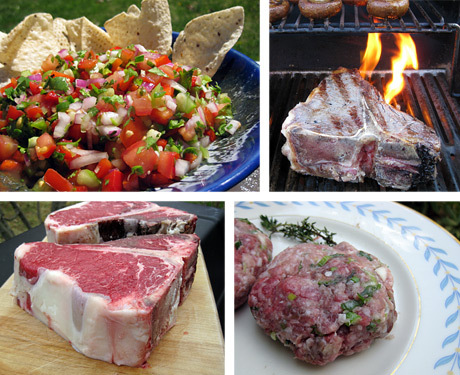 The process is easier than it appears and the results are delicious. Crepes freeze well and can be made well ahead of time. You also have lots of opportunities to get creative around sauces and filling. Julia places the liquids, egg and salt into a blender, and then adds the flour and then butter. I just whisk it together (in that order) by hand. You might be surprised at how thin the batter is, but that is correct — to quote Julia, it should just “coat a wooden spoon.” Cover and refrigerate for at least 2 hours. Making the Crepes I’ve never actually owned a proper crepes pan, and do not let that stop you. In the era before non-stick pans, I used a small frying pan and oil. Now I just use a six inch non-stick pan (see the picture below). We’ll see if I horrify professionally-trained Zen, but here is my approach: heat up the pan on a medium to medium-high flame, and hold it in one hand. With the other hand, scoop out about 2/3 to 3/4 of batter in a soup spoon. Pour into the pan and very quickly rotate and tilt the pan around with your wrist (kind of like a spinning top that is losing momentum), so that the batter spreads out across the pan surface evenly. You want just enough batter to fill the bottom of the frying pan. Place the pan on the heat for 1 to 2 minutes. The bottom should lightly brown. 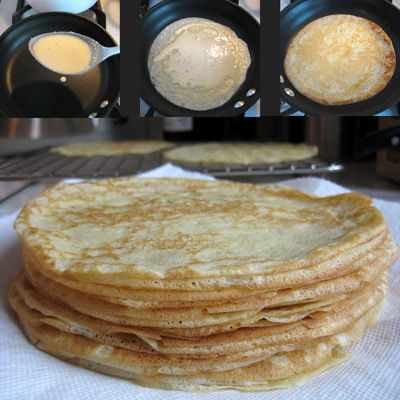 Gently lift and edge of the crepe with a spatula, then scoop under and flip. Cook for another 30 to 90 seconds (depends on heat of pan). Then place on a wire rack to cool for a couple of minutes before stacking, and repeat the process. It might take a couple tries at first to get the right amounts of batter and motion, but once you have the hang of it, it is fast and easy. To complete your meal, you need to decide upon your crepes filling(s). You can go vegetarian or add meat. You can work with tomato sauces, white sauces, cheeses, or whatever strikes your fancy. If you have Julia Child’s Mastering the Art of French Cooking, her suggested filling recipes are marvelous. 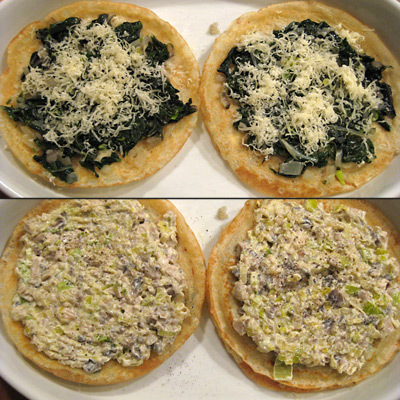 In this case, I made two simple fillings: a chard and parmesan layer and a mushroom, leek and cream cheese layer. For the chard, I chopped and sauted /4 of an onion for a couple of minutes in a tbsp of butter and a splash of olive oil, on medium-low heat, then added the chard stems, finely chopped. After a few minutes, add the chard leaves (roughly chopped), cover, and let cook for several minutes more. Like spinach, the chard leaves will reduce in size. Add a splash of white wine or vermouth, and let cook until the leaves are fully tender, and taste for salt and pepper. After spreading this filling on the crepe, add a layer of grated parmesan cheese. You can cook this at the same time as the chard. Place a tbsp of butter and a splash of olive oil in a pan and saute the onions and leeks on medium-low heat until softened, around 10 minutes. Add the mushrooms, a pinch of ground nutmeg and a little salt and pepper. Once the mushrooms are fully cooked, remove from heat and stir in the cream cheese. In a lightly-buttered baking dish, put down two crepes (for two different stacks). On this bottom crepe, smooth out some of the chard filling and sprinkle grated cheese on top. 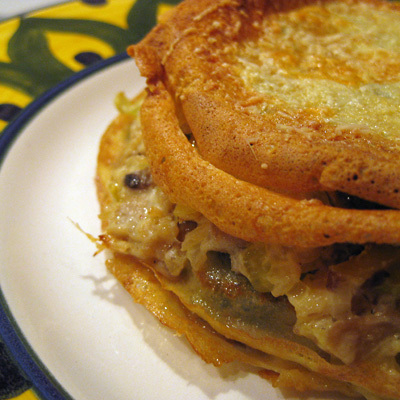 Then place another crepe on the stack and spoon out some of the mushroom and leek filling. Layer another crepe with chard filling, then a crepe with mushroom filling, and finally top with a final crepe and sprinkle more cheese on top. In this case, I did not have a wet tomato or bechamel sauce, so the top crepe became quite crispy, but if you do make a wet sauce, save some from your mixes so you can ladel on the top of your stack. Place the baking dish in the upper third of the pre-heated 350F oven and bake for about 25 minutes. To serve, you can cut into wedges or just place the entire stack on a plate.